Bearberry is known as Kinnikinnick which is pronounced KINNY-kin-ICK, or Kinn-ICK-innick, and is belived to come from the Alonquin meaning “smoking mixture.” Bearberry comes from its genus Arctostaphylos, from the Greek word for bear – Arktos and staphylos – a bunch of grapes, which its berries resemble. The species name of uva-ursi is apparently from the Latin uva (grape) and ursus (bear). 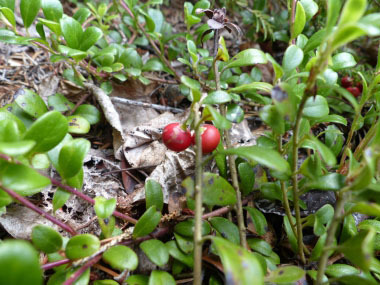 Bearberries look like lingonberries (Vaccinium vitis-idaea), but they are not related. 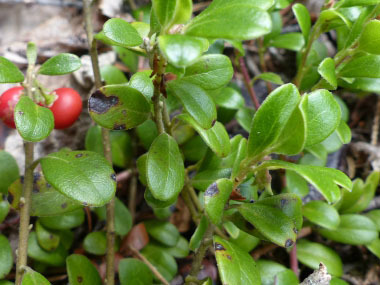 Lingonberry’s stems are erect: bearberry is limply creeping and only the tips of the stems are slightly ascending. 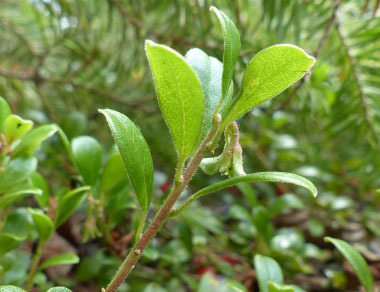 Bearberry’s leaves are narrower and gradually tapering towards the base. 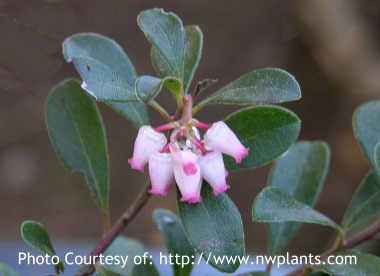 Distinguishing Features: Bearberry is a trailing, evergreen shrub with paddle-shaped leaves on flexible branches. The thick, leathery leaves are rolled under at the edges. They are yellow-green in spring, dark-green in summer, and reddish-purple in the fall. Leaves remain on the bush year-round. This low-growing shrub slowly spreads to form dense mats. This ground-trailing shrub has the papery, reddish, exfoliating bark typical of woody plants in northern climates. It is frequently seen as a ground cover in sandy areas. Flowers: Small clusters of white-pink flowers hang down from the tips of branches. Their five petals are fused together, giving them an upside-down frilly-vase look. Blooms can appear any time from April to July. Fruit develops at the end of summer. Flowers produce red, shiny berries that are rather tasteless. 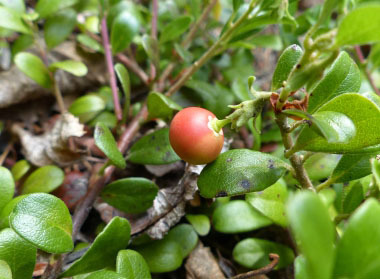 Fields of Nutrition has medicinal benefits and vitamin/mineral content of Bearberry. Leaves: Leaves are alternate, short-stalked, and they overwinter. Leaf blades are obovate, 1 to 3 cm (0.4 to 1.2”) long, leathery, glabrous, underside is green, and they have a clear net-like leaf venation. Height: Bearberry typically grows to 15 to 20 centimetres (6 to 8”) tall. Its older stems tend to be reddish-brown to grey, fairly smooth and peeling, whereas new stems can be redder and covered with smooth hair. Habitat: Bearberries typically grow along sandy and rocky areas including shorelines, slopes, ridges, hilltops and in coniferous and mixed woods. This hardy plant grows at various levels from sea level to sub-alpine. They also grow in dry forest heaths, sand and gravel embankments. 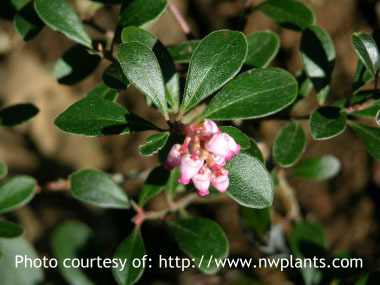 It is the only Arctostaphylos species to occur outside of North America, ranging across northern Europe and Asia and it is found in the mountains of Guatemala. Edible parts: The bright red berries are edible and young leaves are often used as tea.